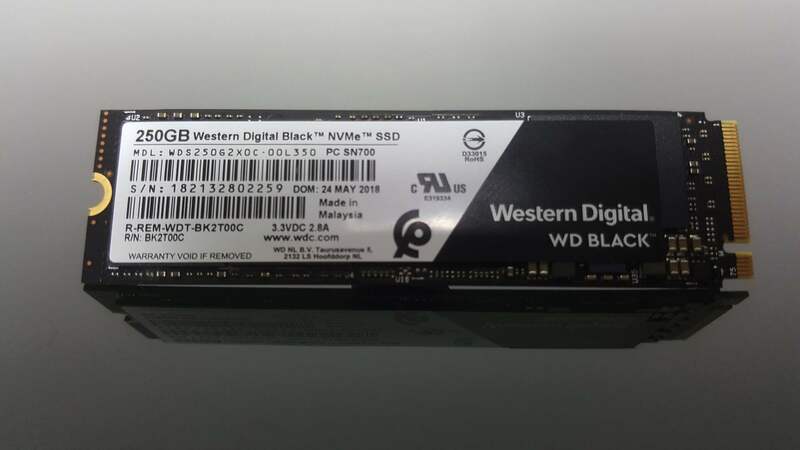 The WD Black SSD offers NVMe storage speed for a bargain price. It introduces SanDisk’s 3D NAND into its consumer SSD range and pairs it up with an in-house memory controller. Solid state storage is a tough market at the moment, with Samsung largely ruling the roost, but with its combination of great price and high-end performance the Western Digital Black drive is well-positioned to challenge the best in the business. 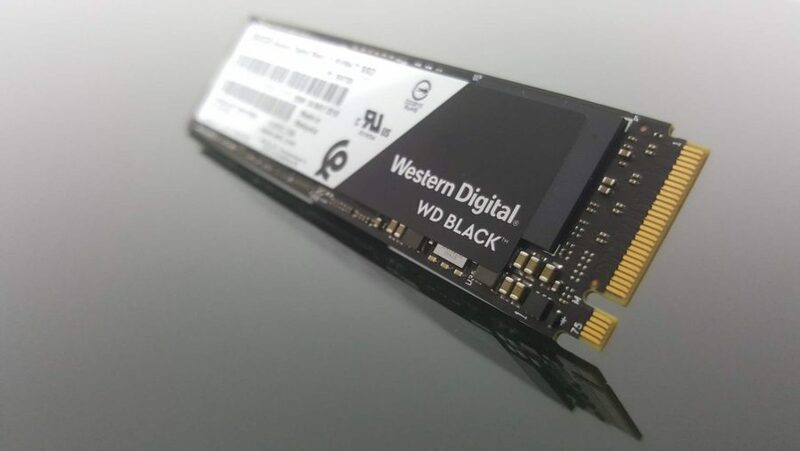 Because SanDisk and WD are both part of the same family now, that means this WD Black drive is identical to the SanDisk Extreme Pro NVMe drive under the hood. And that’s no bad thing, the Extreme Pro name has been wrapped around some of my favourite drives of times gone by and, when you’re sticking your precious gaming OS install on an SSD, trust is a valuable commodity. At just $85 (£72) for this 250GB drive Western Digital is directly competing with the latest Samsung 970 EVO SSDs. The 250GB version of Samsung’s NVMe option is $88 (£67), making the pricing, at least, very much on par. With WD now moving away from using the standard Marvell memory controller so many companies are using to build their SSDs around – the same controller it used for the previous WD Black drive – it’s now following the same trend as Samsung. That means it’s using both its own memory to fulfil the drive’s capacity and also now it’s own in-house memory controller. This is the tack that has driven Samsung to sit at the top of the SSD tree for so many years, giving the company the ability to make affordable, powerful drives, with complete control over the pricing in a market where others have to contend with the vagaries of memory supply and demand. Western Digital is then pairing its own homebrew 28nm triple-core controller with the SanDisk/Toshiba 64-layer 3D triple layer cell (TLC) NAND, along with just a dash of SK Hynix DDR4 in there to act as cache. It’s an M.2 drive, using the NVMe protocol to communicate over the PCIe lanes faster than any SATA drive can manage, and with rated sequential write performance that’s actually higher than Samsung’s 970 EVO drives of the same capacity. Like Samsung’s consumer-focused EVO drives, WD is mitigating the slower performance of the TLC memory in the drive by using caching techniques to get the most out of it. The nCache 3 system operates in a similar way to Samsung’s TurboWrite, apportioning some of the drive’s capacity as speedier SLC memory for relatively small operations. WD doesn’t give out the scale of SLC cache that it uses on a drive-by-drive basis, but the 1TB drive has a 20GB cache, so you can bet the 250GB drive’s SLC will be significantly lower than that. 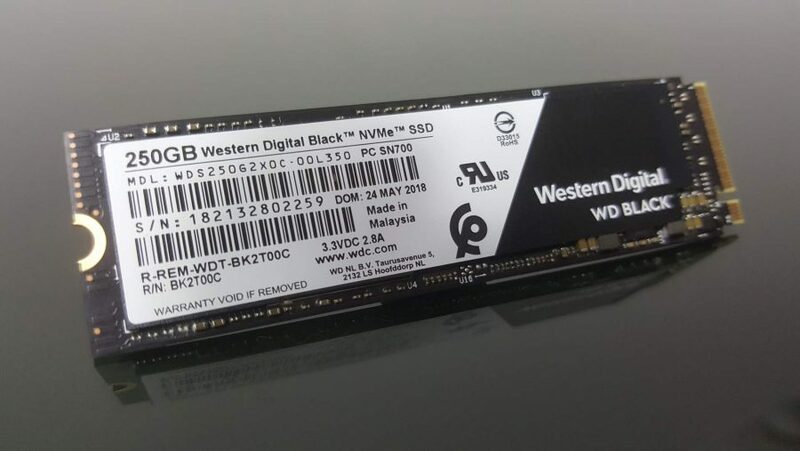 WD is also very confident in its latest SSDs too, because it’s offering a full 5 year warranty on the WD Black, the same as the 970 EVO, but with a higher total bytes written (TBW) drive endurance rating. The WD Black 250GB is designed to hit 200TB over its lifetime, while the competing Samsung sits at 150TB. When you look at the 500GB and 1TB comparisons, however, then the TBW rating is the same across the board, at 300TB and 600TB respectively. Though the WD drive still has the edge on rated sequential write performance. But the rated performance is one thing, how does the Western Digital SSD perform under our own independent test conditions? Remarkably well, in fact. Using the simple ATTO sequential performance benchmark you can see the 250GB drive actually exceeds its rated speeds, something we’ve not seen other drives do before. That inevitably changes when looking at the more-rigorous AS SSD benchmark, which uses incompressible data to confound the clever algorithms baked into these modern drives. There the performance is notably slower, arguably by a greater delta than we might have expected. The 4k random read/write performance – a good indicator of a general OS-based experience – is also nothing special to write home about. But the real-world file transfer tests show the WD Black actually outperforming a 1TB Samsung 970 EVO in the compression stakes, if not in the overall large mixed file type transfer test. But then the 1TB Samsung is far more expensive than the 250GB drive, and the 250GB 970 EVO SSDs will be much closer in their actual pace. The WD Black 250GB drive then is a smart little SSD, offering a level of performance not really seen outside of the solid state Samsung hegemony, and at a super-competitive price too. This smaller capacity version is perhaps a little diminutive for my tastes, with today’s game sizes you could barely fit three triple-A titles on there alongside your SSD before you start running out of space. Though a backup hard drive and an Intel Optane cache drive would be a cheap alternative to a larger SSD, the $130 (£100) price tag of the 500GB version remains a mighty tempting SSD option.